poisepolish. : Win Club 21b & Tsumori Chisato Cocktail Opening Invites! Win Club 21b & Tsumori Chisato Cocktail Opening Invites! Mark 25 March in your diaries – two fabulous fashion store launches occur on the same Friday evening! Join us for martinis and champagne at the new Club 21b and Tsumori Chisato boutiques, both in Forum The Shopping Mall. Preview Club 21b's fashion showcase , view Tsumori Chisato's retrospective display of outfits she designed in the past 20 years; and meet the designer in person! 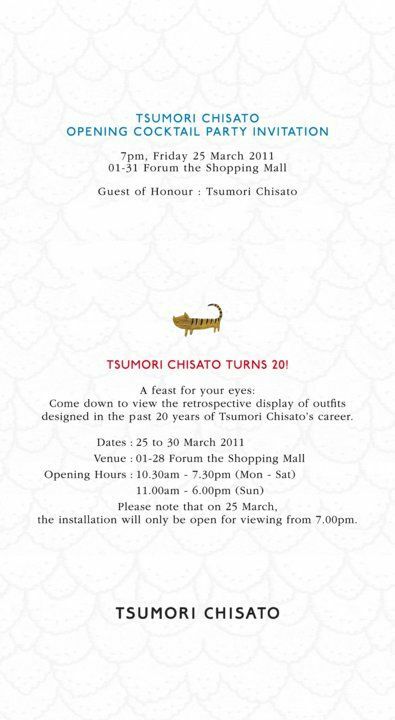 The good news is that Club 21b + Tsumori Chisato has 3 pairs of invites to giveaway on my blog. What are the unit numbers of Club 21b and Tsumori Chisato in Forum The Shopping Mall? Hit the comments button with your answers and e-mail address! Winners will be contacted by Club21 associates. Club 21b at 01-07 & 01-10. Tsumori Chisato at 01-31. Club 21b at #01-07 & #01-10. T. Chisato is at #01-31, right at the entrance of Forum.